Do you enjoy cooking and entertaining guests? An outdoor kitchen is right up your alley. Just like with an indoor kitchen countertop, there are a lot of ways to customize an outdoor kitchen countertop. Do you enjoy cooking and entertaining guests? An outdoor kitchen is right up your alley. Just like with an indoor kitchen countertop, there are a lot of ways to customize an outdoor kitchen countertop. If you own a patio or deck and want to enhance your outdoor living space, then adding an outdoor kitchen with a stylish, durable kitchen countertop is the way to go. 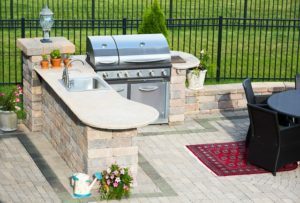 Keep reading below to discover creative ways in which you can make an outdoor kitchen countertop optimal for your needs. If not the best, granite is one of the top choices for an outdoor kitchen countertop. Granite comes in various colors and won’t suffer from heat damage. Also, to preserve granite and protect it from the elements, you need to make sure that you seal the stone so that it won’t be susceptible to mildew, stains, or mold. Soapstone is yet another natural stone that has many benefits, just like granite. For one, soapstone also doesn’t suffer from heat damage. You don’t need to seal soapstone nor do you have to worry about colors fading because the material is highly durable. Soapstone darkens over time, adding to its aesthetic appeal. Mineral oil can help to aid in that process and preserve the natural stone. Did you know that Ice Stone is eco-friendly? Its components include recycled glass and concrete also with containing materials that aren’t volatile organic compounds (VOC’s). VOC’s are incredibly harmful to the environment. Ice stone is stronger than marble and as durable as granite. Vetrazzo is eco-friendly as well, comprised of 100% recycled glass. Since terrazzo is all glass, it can add a glossy layer to your outdoor kitchen countertop. Such a sparkle adds elegance. Vetrazzo, as well as Ice Stone, are comparable to granite. Maintenance won’t be taxing, and you can enjoy all the benefits of adding a kitchen to your outdoor living space. An outdoor kitchen is a unique way to embellish your property. It adds space and you can enjoy your favorite meals outside. Regardless of what materials you decide to use, there are a variety of styles and materials to choose from. Spring is here, and you deserve to bask in the beauty of the sun. ROCK TOPS FABRICATIONS USES THE LATEST TECHNOLOGY TO ENSURE THAT YOUR NEW Outdoor Kitchen IS DESIGNED, CUT, AND FINISHED EXACTLY HOW YOU WANT IT. WE HAVE OVER A DECADE OF EXPERIENCE AND HAVE BEEN CONSTANTLY IMPROVING OUR SERVICES AND OFFERINGS TO MEET THE DIVERSE NEEDS OF OUR CUSTOMERS. IF YOU ARE IN THE MARYLAND, D.C., OR VIRGINIA AREA AND LOOKING FOR A BEAUTIFUL NEW REMODELED KITCHEN, GIVE US A CALL AT 410-363-4257. FOR MORE INFORMATION AND TIPS ON MAKING YOUR HOME YOUR OWN, FOLLOW US ON SOCIAL MEDIA on Twitter, Facebook, Youtube, Pinterest, and Houzz. This entry was posted on Thursday, April 11th, 2019 at 10:50 am. Both comments and pings are currently closed.